The original Village of Nunda (the area is now commonly known as Downtown Crystal Lake) was first platted in the 1860’s by local surveyor, John Brink. As Nunda grew, the demand for additional housing also grew. One of the earliest housing subdivisions was established in 1874, when Josiah Walkup subdivided part of his property, creating the subdivision known as “Walkup’s Addition to Nunda.” One of the perks of creating a subdivision is the ability to name streets. It is presumed that Josiah named “Caroline Street” after his only daughter, Caroline. Caroline M. Walkup was born October 30, 1844 in McHenry County, Illinois. Her parents were Josiah Walkup and Margaret St. Clair. Both the Walkup and St. Clair families were early settlers of McHenry County. Josiah and Margaret were the 56th couple to be married in McHenry County (March 10, 1840). The Josiah Walkup family lived in a home located at the southwest corner of today’s intersection of Walkup Avenue and Route 176. Sadly, the house was demolished a few years ago. Josiah served as a trainman for the North Western Railroad during the mid 1800’s. For many years, the terminus of that line was at “Walkup’s Crossing” on his property. Josiah was also a partner in the Crystal Lake Pickling & Preserving Works, which was located just south of the railroad tracks near today’s intersection of Walkup Avenue and Woodstock Street. On October 17, 1867, Caroline Walkup married Addison V. Teeple. Addison was born May 25, 1843 in Oxford, Ontario, Canada. Shortly thereafter, the Teeple family moved to Illinois, acquiring land in both McHenry and Kane Counties. From 1861-1865 Addison Teeple fought for the Union Army, serving in the 8th Illinois Cavalry, and eventually attaining the rank of 2nd Lieutenant. The 1870 Census shows Addison and Caroline Teeple living in Rockford, Winnebago County, Illinois. They had one son, Josiah, who was born July 25, 1868. 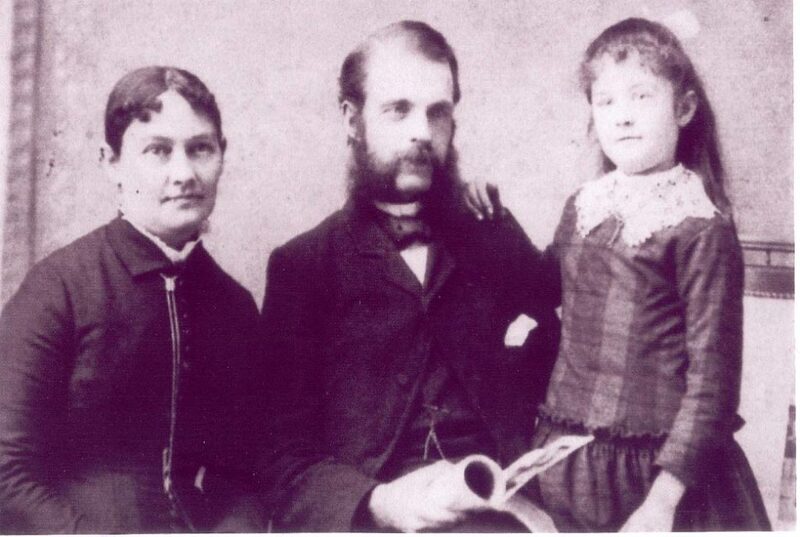 In 1872, the family moved to St. Paul, Minnesota, where Addison became an attorney. On March 12, 1872, a daughter, Mary Teeple was born. Tragedy struck the young family on August 6, 1873 when young Josiah died. The cause of his death is unknown. Addison Teeple died in St. Paul on September 3, 1892. Ten years later, his widow, Caroline Walkup Teeple, and daughter Mary moved to San Mateo, California. Mary married Henry Gervais. The couple had no children. Caroline Walkup Teeple died in San Mateo, California on May 26, 1932. Her daughter Mary Teeple Gervais died September 26, 1956.